The US Food and Drug Administration (FDA) has published a new draft guidance on ways to minimize medication errors through designing products with safety considerations in mind, part of the agency's unfinished efforts under the FDA Amendments Act (FDAAA) of 2007. The guidance, posted to FDA's website on 12 December 2012, notes that it is intended to provide sponsors of pharmaceutical and biopharmaceutical products with "a set of principles for developing drug products using a systems approach to minimize medication errors relating to product design." Those considerations include both the product and the container in which the product is contained, FDA explained. The measures are a part of FDAAA, which included provisions aimed at reducing medication errors in a number of areas, most notably in drug names that sound or look similar, unclear labeling, dose designations and "error-prone" packaging designs. The importance of reducing drug harms, as elucidated in the landmark 2000 Institute of Medicine Report To Err is Human, is difficult to overstate. That report concluded that between 44,000 and 98,000 deaths per year are the result of medical errors-a number FDA notes would make medical errors the eighth leading cause of death in the US. As a result of the report, IOM-and later Congress, through FDAAA-directed FDA to issue guidance and standards on the design of drug products to reduce medication errors. While FDA noted that guidances on these safety improvements were due to be published in 2010, it has only now gotten around to posting the first of what it calls a "series of planned guidance documents to minimize risks contributing to medication errors." The two subsequent guidance documents will focus on, respectively, labeling and drug product nomenclature. The focus of the first guidance is on what FDA refers to as "safety by design"-a set of concepts intended to reduce errors by analyzing how users are-or are likely to-interact with a given product. The guidance is in many ways similar to another guidance published on 12 December 2012 by FDA regarding the design of medical device products used in home healthcare settings by non-professionals-also known as home use devices. Both guidance documents emphasize making sure that products are designed with the mitigation of unnecessary risks in mind. Key in the design of quality products is testing and an iterative design process. FDA's guidance notes that companies should not feel that they can just slap a label on a product indicating its flaws and absolve themselves of their responsibilities to patients; rather, products must, to the extent possible, minimize the risks to patients. Those risks fall into three main categories: environmental risk, the product-user interface and the identity of the end user. On the environmental risk side, FDA advises sponsors to consider where the products might be used, including the lighting levels, potential distractions, the storage of the drugs, similarity of the drugs to others in its environment, and whether the product could have a particular impact on the environment. 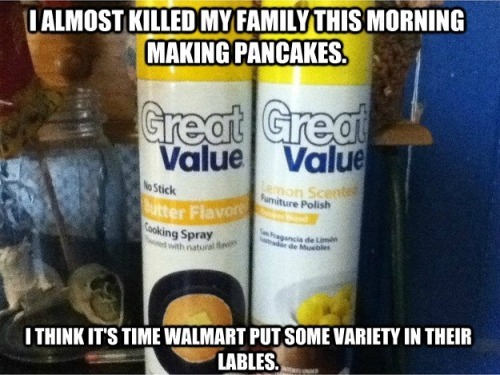 A non-healthcare example is perhaps best illustrated by the similarities between WalMart's brand of butter flavoring spray and lemon-scented cleaner, both of which use a nearly identical color scheme and container. In a medical setting, a similar mix-up of healthcare products could be deadly. FDA also devotes considerable time in its guidance to the design of products, which it refers to as the product-user interface. This includes everything from how different dosing formulations of a product look, the structural integrity of a product (i.e. making sure a solid-dose product won't crumble before use), the scoring of tablets, the handling of transdermal systems before and after application, and the container products are kept in. FDA said containers are frequently a source of frustration and problems-oral dose products kept in vial dose containers, leading to intravenous administration; bulk-use bottles that look the same regardless of whether they contain 30 pills or 90, causing incorrect dispensing; and container closures with labeling imprinted upon them not being durable enough to prevent the label from being made illegible through repeated use. Manufacturers also need to be cognizant of the differences between different types of users. A closure system intended for an elderly patients might not be the same as one intended for a 30-year-old adult or a child. A drug for arthritis might be best contained in an easy-to-open bottle, while a drug for patients with vision-based difficulties should probably be within an easy-to-read container. The administration of products should also be clear to patients, many of whom may not be well-versed in medical terminology or how to administer a particular product. FDA's guidance goes on to recommend the use of "proactive risk assessments" to consider all factors that might impact the use of a product, including exploratory, formative and simulated use evaluations. The latter category will be of particular use to manufacturers, FDA said. Failure Mode and Effects Analysis (FMEA)-a mode of testing used to estimate the chance of failure at each step of a product's use-and simulated use testing-in which a product undergoes real-world testing in controlled environments-are both recommended highly by FDA in its guidance. FDA's thinking, as outlined in the guidance, will eventually apply to investigational new drug applications (INDs), new drug applications (NDAs), biologics licensing applications (BLAs), abbreviated new drug applications (ANDAs) for generic drugs and nonprescription over-the-counter (OTC) drugs marketed through a monograph, it said. Comments on the draft guidance are due within 60 days of the document's publication in the Federal Register, expected to occur on 13 December 2012.